Famous for its cathedral, where French kings were traditionally crowned, Reims (pronounced ‘Rance’ with a nasal twang and a gutteral rool on the R if you can manage that! ), is a lovely city on the banks of the River Vesle. Reims has a wealth of interesting buildings, good hotels, excellent restaurants, and of course, lots of lovely bubbly to taste at the various Champagne houses in the city. Reims is one of France's 20 most popular cities for international visitors. Check out detailed information on getting to Reims from London, the UK and Paris. Set in its own parkland, with wonderful views from the terrace, the chateau is a peaceful place for a luxury visit. The stone façade looks older than it is (it was built in 1904). Inside it’s luxurious and comfortable, with elegant fittings. See below for the two restaurants. In a 19th century building once owned by a champagne agent, the hotel is just outside the main center. The bedrooms are comfortable rather than grand and bathrooms are well equipped. It has the advantage of a heated swimming pool. (Breakfast only served). Central hotel with a real whizz (hence the Latino name). Expect a friendly welcome, basic rooms, hot colors and an inexpensive restaurant good for a snack. There’s plenty of choice of restaurants, with many of them around the main Place Drouet-d’Erlon which is always worth exploring, particularly for a light lunch. See the Reims Dining Guide for good restaurants, brasseries and bistros. Reims is associated with Champagne, but there are plenty of edible treats as well. From the 15th century onwards, Reims has been the capital of gingerbread making after King Henry IV legalized the Gingerbread Makers’ Guild. Try the traditional Biscuit Rose (pink biscuits) of Reims, one of the oldest of all French biscuits. Or go for the twice-baked biscuits that have been around -- well, only for 300 years. Around the 1690s, bakers, wanting to find a use for their cooling bread ovens, invented the twice-baked biscuit. Shop for these delicacies in at any of the four branches of Maison Fossier, which has been making biscuits since 1845. Their most central shop is at 25 cours Jean-Baptiste-Langlet. There’s plenty to see and do in the centre of Reims, so ignore the industrial parts that surround and make for the compact area around the cathedral. 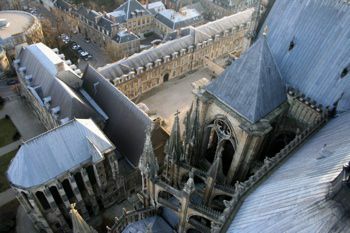 The main attraction is the magnificent Gothic cathedral, one of France’s great treasures. Other places to explore include the Palais du Tau, the former palace of the high and mighty bishops of Reims dating from 1690, and the Basilique St-Remi, dating from 1007. Don’t miss the Musée des Beaux-Arts for its interesting collection, including two Gauguin still lifes and German portraits, and the Musee de la Reddition (Museum of the Surrender), that was Eisenhower’s HQ from February 1945. Many of the major Champagne makers have houses and caves. In the southern part of the centre, near the Abbaye St-Remi, the cellars are particularly impressive, some carved from the Gallo-Roman quarries used to build the city. Some you can visit without making a reservation, particularly in the summer months when they are open for long hours. Others you may have to make a reservation for but then you will get a guided tour in English. Visit Pommery and other Champagne Houses.